Jason here. 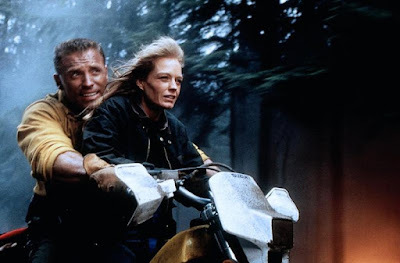 With dozens of forest fires burning within 200 klicks of our fair city, I thought it might be a good idea to revisit the Howie Long action flick Firestorm, because it's about a prison break that takes place during a forest fire. See my train of thought here? This is a solid concept idea for an action thriller. How was the watch, especially given how poorly received the movie was when released two decades ago? Let me elaborate. The stunt work and fire effects are solid. Almost everything is done on camera save for some early CGI flames. But it takes too long for, well, Long, to tackle main villain William Forsythe. They don't actually clash until the final 40 minutes, which is when the bulk of the action occurs. Shameful for a picture like this. Long isn't much of an actor, but he's still good in the role. Ditto the aforementioned Forsythe as the bad guy. And Suzy Amis makes for a spunky heroine. Who doesn't like Scott Glenn as the aged mentor? Everyone does. It was a rhetorical question. Had there been more action, this could have been a winner. As it is, Firestorm is a cool concept that wasn't fully realized.